Joan Miró, Dutch Interior I, 1928. Image via The Peggy Guggenheim Collection, Venice. 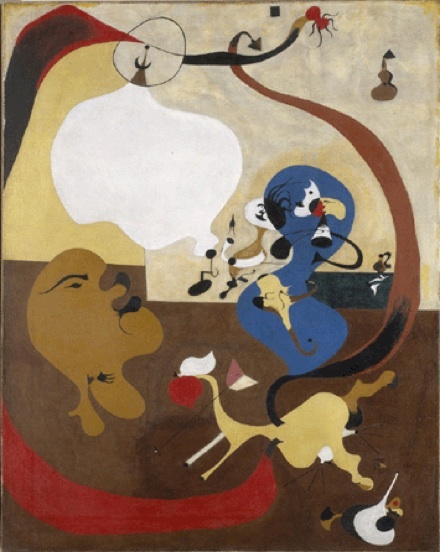 Currently on view at the Metropolitan Museum of Art is “Miró: The Dutch Interiors,” an exhibition featuring three surrealist works and the two seventeenth-century Dutch genre paintings that inspired them. Joan Miró first encountered the domestic scenes of Jan Steen and Hendrick Sorgh when he visited the Rijksmuseum during a 1928 trip to Amsterdam. 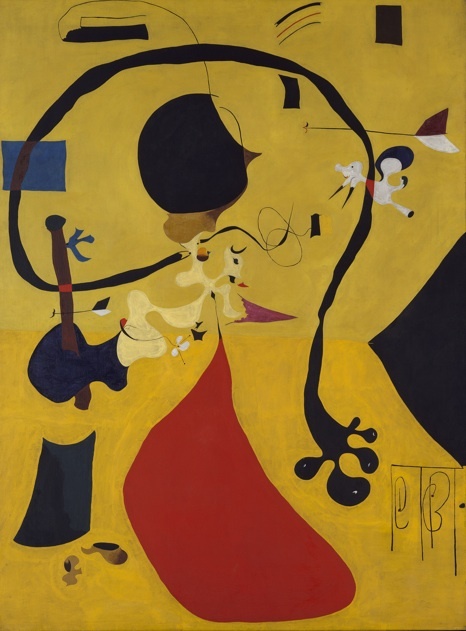 The impact of these works on the Catalan artist resulted in The Dutch Interiors: a series of three paintings in which Miró re-envisions the Old Master works as abstract compositions, nearly four-hundred years after their original production. The exhibition, which debuted at the Rijksmuseum earlier this year, is the first occasion on which Miró’s reinterpretations of these scenes have been displayed with the works upon which they are based. 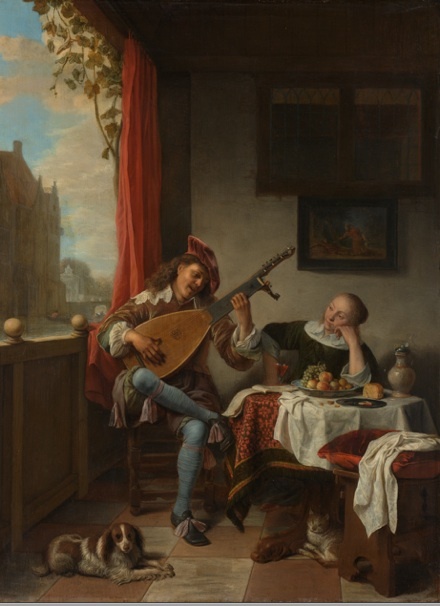 Hendrick Sorgh, The Lute Player, 1660. Image via the Rijksmuseum. 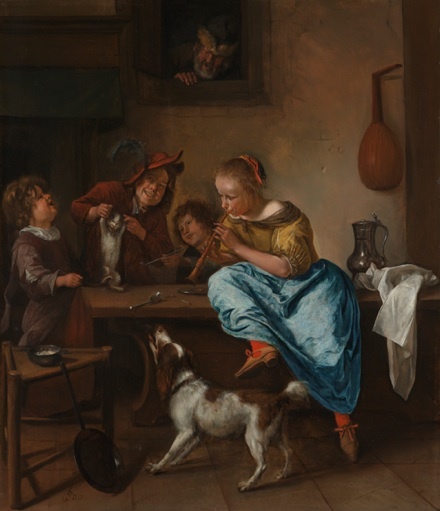 Miró returned to Spain with postcards of Jan Steen’s Children Teaching a Cat to Dance and Hendrick Sorgh’s The Lute Player (both 1660), and began work on the Dutch Interiors series shortly thereafter. Though they are stylistically consistent with the abstract mode in which he was working at the time, Miró’s canvases retain many of the formal qualities and motifs employed by Steen and Sorgh. While exaggerating and distorting the basic geometric forms of The Lute Player, the triangular compositional structure created by the instrument, the cat, and the dog is meticulously reconstructed in Dutch Interior I.
Joan Miró, Dutch Interior II, 1928. Image via The Rijksmuseum. 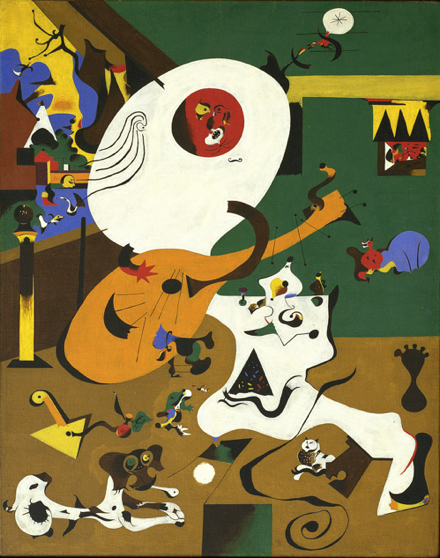 In Dutch Interior II, Miró retains the circular engagement of Steen’s children and their pets, while simultaneously reducing and enhancing certain geometric elements and coloristic properties of each figure in the scene. He extracts and manipulates key features with remarkable fidelity to their essential form, selectively repurposing or redeploying them throughout his own composition. Jan Steen, Teaching the Cat to Dance, 1660. Image via The Rijksmuseum. Joan Miró, Dutch Interior III, 1928. Image via The Rijksmuseum. Also on view in the exhibition are a number of Miró’s studies for the series. Shown alongside the finished works and the paintings that inspired them, the drawings provide unparalleled insight into Miró’s formal preoccupations and process of transformation. A.G. SCHNEIDERMAN ANNOUNCES MAJOR LAWSUIT AGAINST NATION’S LARGEST BANKS FOR DECEPTIVE AND FRAUDULENT USE OF ELECTRONIC MORTGAGE REGISTRY. Attorney General Eric T. Schneiderman today filed a lawsuit against several of the nation’s largest banks charging that the creation and use of a private national mortgage electronic registry system known as MERS has resulted in a wide range of deceptive and fraudulent foreclosure filings in New York state and federal courts, harming homeowners and undermining the integrity of the judicial foreclosure process. The lawsuit asserts that employees and agents of Bank of America, J.P. Morgan Chase, and Wells Fargo, acting as “MERS certifying officers,” have repeatedly submitted court documents containing false and misleading information that made it appear that the foreclosing party had the authority to bring a case when in fact it may not have. The lawsuit names JPMorgan Chase Bank, N.A., Bank of America, N.A., Wells Fargo Bank, N.A., as well as Virginia-based MERSCORP, Inc. and its subsidiary, Mortgage Electronic Registration Systems, Inc.
“The banks created the MERS system as an end-run around the property recording system, to facilitate the rapid securitization and sale of mortgages. Once the mortgages went sour, these same banks brought foreclosure proceedings en masse based on deceptive and fraudulent court submissions, seeking to take homes away from people with little regard for basic legal requirements or the rule of law,” said Attorney General Schneiderman. “Our action demonstrates that there is one set of rules for all — no matter how big or powerful the institution may be — and that those rules will be enforced vigorously. Only through real accountability for the illegal and deceptive conduct in the foreclosure crisis will there be justice for New York’s homeowners.” The financial industry created MERS in 1995 to allow financial institutions to evade local county recording fees, avoid the hassle and paperwork of publicly recording mortgage transfers, and facilitate the rapid sale and securitization of mortgages. MERS operates as a membership organization, and most large companies that participate in the mortgage industry — by originating loans, buying or investing in loans, or servicing loans — are members, including JPMorgan Chase, Bank of America, Wells Fargo, Fannie Mae, and Freddie Mac. Over 70 million loans nationally have been registered in MERS System, including about 30 million currently active loans. MERS has granted over 20,000 “certifying officers” the authority to act on its behalf, including the authority to assign mortgages, to execute paperwork necessary to foreclose, and to submit filings on behalf of MERS in bankruptcy proceedings. These certifying officers are not MERS employees, but instead are employed by MERS members, including JPMorgan Chase, Bank of America, and Wells Fargo. MERS’ conduct, as well as the servicers’ use of the MERS System, has resulted in the filing of improper New York foreclosure proceedings, undermined the integrity of the judicial process, created confusion and uncertainty concerning property ownership interests, and potentially clouded titles on properties throughout the State of New York. In fact, several New York judges have questioned the standing of the foreclosing party in cases involving MERS loans and the validity of mortgage assignments executed by MERS certifying officers. MERS has filed over 13,000 foreclosure actions against New York homeowners listing itself as the plaintiff, but in many instances, MERS lacked the legal authority to foreclose and did not own or hold the promissory note, despite saying otherwise in court submissions. MERS certifying officers, including employees and agents of JPMorgan Chase, Bank of America, and Wells Fargo, have repeatedly executed and submitted in court legal documents purporting to assign the mortgage and/or note to the foreclosing party. These documents contain numerous defects, including affirmative misrepresentations of fact, which render them false, deceptive, and/or invalid. These assignments were often automatically generated and “robosigned” by individuals who did not review the underlying property ownership records, confirm the documents’ accuracy, or even read the documents. These false and defective assignments often masked gaps in the chain of title and the foreclosing party’s inability to establish its authority to foreclose, and as a result have misled homeowners and the courts. MERS’ indiscriminate use of non-employee “certifying officers” to execute vital legal documents has confused, misled, and deceived homeowners and the courts and made it difficult to ascertain whether a party actually has the right to foreclose. MERS certifying officers have regularly executed and submitted in court mortgage assignments and other legal documents on behalf of MERS without disclosing that they are not MERS employees, but instead are employed by other entities, such as the mortgage servicer filing the case or its counsel. The signature line just indicates that the individual is an “Assistant Secretary,” “Vice President,” or other officer of MERS. Indeed, these documents often purport to assign the mortgage to the certifying officer’s own employer. Moreover, as a result of the defendants’ failure to track the designation of certifying officers and the scope of their authority to act, individuals have executed legal documents on behalf of MERS, such as mortgage assignments and loan modifications, when they were either not designated as a MERS certifying officer at the time or were not authorized to execute documents on behalf of MERS with respect to the subject loan. MERS and its members have deceived and misled borrowers about the importance and ramifications of MERS’ role with respect to their loan by providing inadequate disclosures. The MERS System is riddled with inaccuracies which make it difficult to verify the chain of title for a loan or the current note-holder, and creates confusion among stakeholders who rely on the information. In addition, as a result of these inaccuracies, MERS has filed mortgage satisfactions against the wrong property. The lawsuit seeks a declaration that the alleged practices violate the law, as well as injunctive relief, damages for harmed homeowners, and civil penalties. The lawsuit also seeks a court order requiring defendants to take all actions necessary to cure any title defects and clear any improper liens resulting from their fraudulent and deceptive acts and practices. The matter is being handled by Deputy Bureau Chief of the Bureau of Consumer Frauds and Protection Jeffrey K. Powell, Assistant Attorney General Clare Norins, and Assistant Solicitor General Steven C. Wu, under the supervision of First Deputy Attorney General Harlan Levy. Final Summons And Complaint For Adobe PDF files you can download Adobe Reader from Adobe Systems. 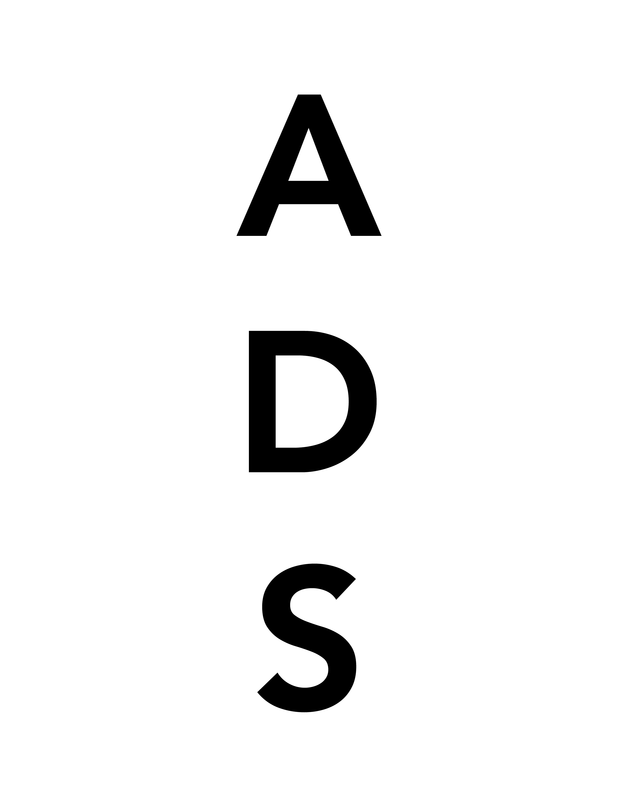 This entry was posted on Wednesday, October 6th, 2010 at 5:07 am	and is filed under Art News. You can follow any responses to this entry through the RSS 2.0 feed. You can leave a response, or trackback from your own site.